Although chemokines are sufficient for chemotaxis of various cells, increasing evidence exists for their fine-tuning by selective proteolytic processing. 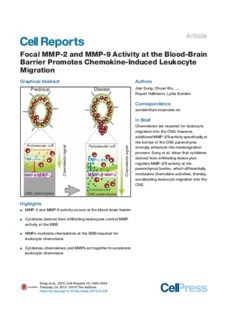 Using a model of immune cell chemotaxis into the CNS (experimental autoimmune encephalomyelitis [EAE]) that permits precise localization of immigrating leukocytes at the blood-brain barrier, we show that, whereas chemokines are required for leukocyte migration into the CNS, additional MMP-2/9 activities specifically at the border of the CNS parenchyma strongly enhance this transmigration process. Cytokines derived from infiltrating leukocytes regulate MMP-2/9 activity at the parenchymal border, which in turn promotes astrocyte secretion of chemokines and differentially modulates the activity of different chemokines at the CNS border, thereby promoting leukocyte migration out of the cuff. Hence, cytokines, chemokines, and cytokine-induced MMP-2/9 activity specifically at the inflammatory border collectively act to accelerate leukocyte chemotaxis across the parenchymal border.